The League’s Capital Conference is a critical policy briefing for municipal officials to gain understanding of key issues that will affect their communities in the coming year. 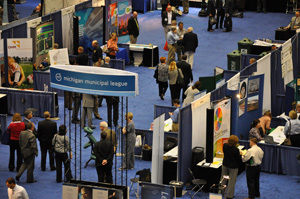 The Annual Expo is an important educational component of the Capital Conference, attended by local government decision-makers responsible for millions of dollars in annual purchasing. It is a key event where local officials can meet vendors face-to-face to learn about products, services and emerging technologies. Return here later in the year for updated information on next spring's Annual Expo!